to benefit Save the Harbor/Save the Bay's Better Beaches Program! Nearly 200 brave splashers took a quick dip into the cold, clean harbor to raise money to support free programming on Boston's public beaches- and boy were they successful! Thanks to 609 donors we crushed our goal and raised $39,500 to give back to beaches friends groups and community organizations to run free events on the region's public beaches in Lynn, Nahant, Revere, Winthrop, East Boston, South Boston, Dorchester, Quincy and Hull. Click here to learn more about why we splash! After the splash, participants were greeted with refreshing Harpoon Beer and burgers from Sullivan's as they warmed up for the beach party. Despite the flurries, everyone had a blast getting together to celebrate the end of the Wicked Winter of 2015- the sun even came out for a bit to help warm everyone up! 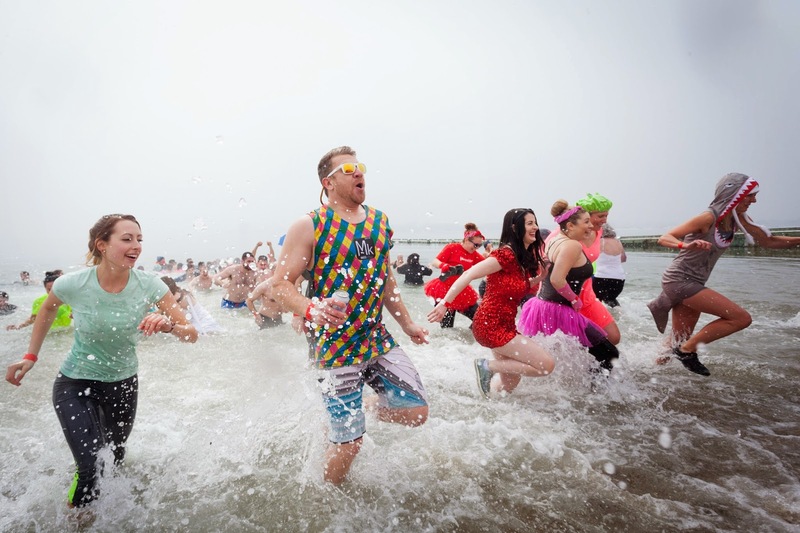 "What a fitting way to end the Wicked Winter of 2015" said Charles Storey, President of event sponsor Harpoon Brewery who splashed again with us this year. "A quick dash on the first Saturday of Spring across a snowy beach, a quick dip into the icy water of Boston Harbor, and a refreshing Harpoon and a Sullivan's burger on one of the cleanest urban beaches in America, to support a very good cause." "It was record breaking winter and thanks to everyone who joined us on the beach it is going to be a tremendous summer." said Bruce Berman of Save the Harbor/Save the Bay. "Thanks to all our sponsors and friends for helping us make this year's Harpoon Helps Cupid Splash the best ever." 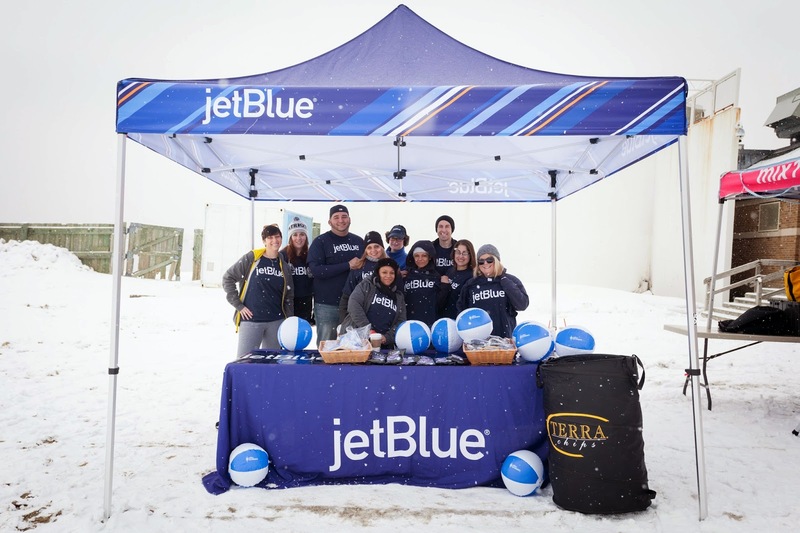 thanks to our friends and partners at JetBlue! 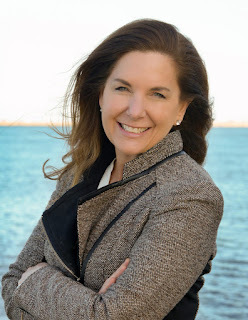 "As a South Boston resident, open water swimmer, runner and triathlete I feel so fortunate to have the ocean in my own 'backyard' and feel a certain obligation to help protect it for others to enjoy," said Tina Karas, Best Female Costume winner. "The events hosted by Save The Harbor Save The Bay are just one way we can all come together, have some fun and help make a difference for such an important cause." "This year, we are celebrating the weekend of World Water Day with our partners at Save the Harbor/Save the Bay. 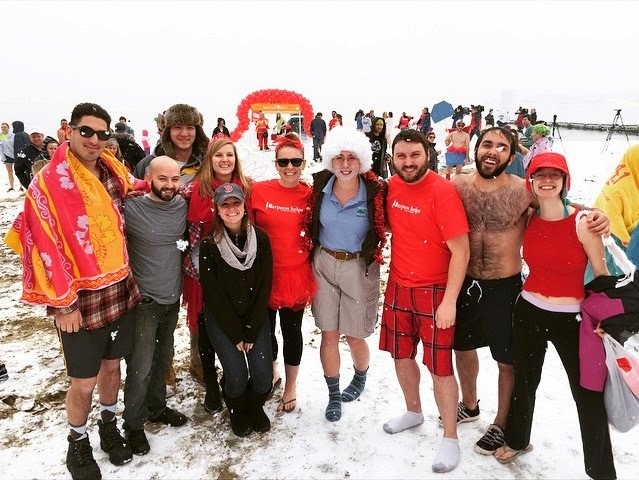 Our Boston and New England crewmembers look forward to teaming up with Save the Harbor every year for this cold-water plunge!" Said Rhonda Ivy-McLeod, Manager Regional Marketing, JetBlue Airways. "JetBlue's mission is to inspire humanity and we work hard to help protect our greatest natural resource-- the ecosystem. As an airline, we are taking action to help oceans and beaches throughout our network remain clean and protected so our customers and crewmembers are able to enjoy these shorelines, now and in the future." Thank you to everyone who helped make this year's Cupid Splash such a success! As you all know by now, this Saturday, March 21, 2015 Save the Harbor/Save the Bay expects two hundred people to join us at the Harpoon Helps Cupid Splash at the BCYF Curley Community Center at M Street Beach in South Boston. 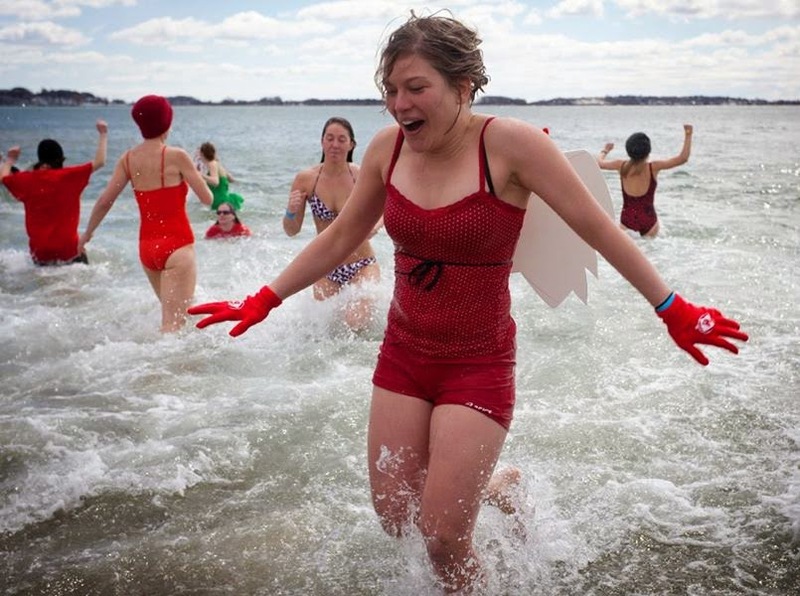 We are splashing in the cold, clean water of Boston Harbor to celebrate the end of the Wicked Winter of 2015, and to raise money for Save the Harbor's Better Beaches Program which hosts or sponsors free events and programs on the region's public beaches in Lynn, Nahant, Revere, Winthrop, East Boston, South Boston, Dorchester, Quincy and Hull. In 2014, we awarded $31,500 raised at the Harpoon Helps Cupid Splash to 18 groups in 9 beachfront communities and waterfront neighborhoods to support more than 30 free concerts, beach festivals and sand sculpting competitions on the Boston Harbor region's public beaches from Nahant to Nantasket. We also hosted a few events of our own, including our annual Youth Beach Bash and Splash, which this year brought 788 kids to the beach to celebrate clean water. As you can see, they made a pretty big splash of their own! Over the past 7 years, Save the Harbor's Better Beaches Program community partners have leveraged the $205,000 we raised at the Harpoon Helps Cupid Splash with $815,722 in cash and in-kind donations from local government and small businesses for a total investment of $1,020,722 in more than 200 free events and programs for the region’s residents and visitors alike. This year, at the recommendation of the Metropolitan Beaches Commission, the Legislature appropriated additional funds to support free events and programs on the beach in Lynn, Nahant, Revere, Winthrop, East Boston, South Boston, Dorchester, Quincy, Hull and in the Boston Harbor Islands. The Department of Conservation and Recreation has asked Save the Harbor/Save the Bay to invest these funds along with the proceeds from this year’s Harpoon Helps Cupid Splash as part of our Better Beaches Program. 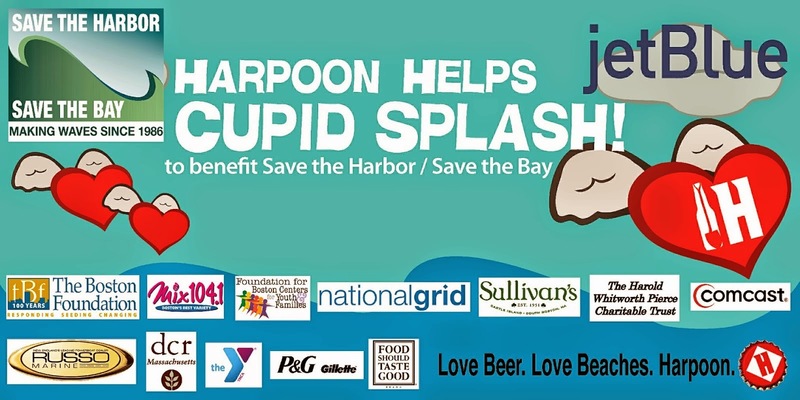 The Harpoon Helps Cupid Splash is a lots of fun, with refreshing Harpoon Beer and burgers from Sullivan's and great prizes for best costume and biggest fundraisers thanks to our friends and partners at JetBlue Airways, where fun is one of their core values! We hope that you will join us on the beach - and in the water - on Saturday. We will all be cold for a few minutes - but the warm feeling we will get from taking part in this great event will last until summer begins. P.S. You don't have to splash to take part in the party. Just register as a "Chicken" and join us on the beach! Boston Harbor Beaches: Cold but Clean! 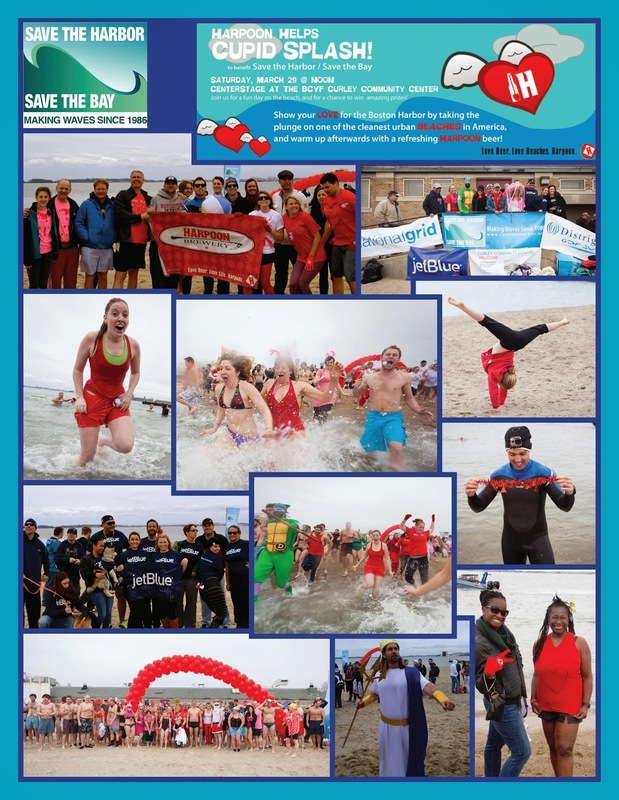 When Harpoon Helps Cupid Splashers hit the beach at the BCYF Curley Community Center at M Street Beach in South Boston for their annual plunge and pledge fundraiser at noon on Saturday, March 21, 2015 the water will be a chilly 35 degrees. However, the 200 cupid costumed participants can take some cold comfort in knowing that South Boston's beaches are among the cleanest urban beaches in the nation, according to a recent study conducted by Save the Harbor/Save the Bay policy interns Vincent Pei, Jingwei Zhang and Mehar Kaur. Boston's Harbor is a chilly 35 degrees - and very, very clean! The study compared water quality on urban beaches in South Boston with data from iconic American urban beaches including New York's Coney Island, Virginia Beach, VA, Miami's South Beach, Santa Monica Beach in California and Waikiki Beach in Hawaii from 2011 to 2013. The results? South Boston's beaches topped the list, scoring 98.2%, followed by Virginia Beach, VA at 97.67%, South Beach, Fl at 97.38%, Waikiki Beach, Hi at 97.05%, Coney Island Beach, NY at 95% and Santa Monica, CA at 81.74%. "Thanks to Save the Harbor's sustained advocacy and continued investment in clean water by the Massachusetts Water Resources Authority and the Boston Water and Sewer Commission, South Boston is now home to some of the cleanest urban beaches in America" said Save the Harbor/Save the Bay's Director of Strategy, Communications and Programs Bruce Berman. "After the wicked winter we have had here we will still freeze our fannies off tomorrow, but its good to know that we will be splashing in very clean water!" "Its only fair to point out that water temperatures on Saturday at Waikiki Beach in Honolulu will be 78 degrees, 73 degrees on Miami's South Beach and a refreshing 66 degrees at the Santa Monica Pier." said Berman. "But on the bright side, we have more snow!" Save the Harbor/Save the Bay will publish the final results of the study in the spring when they issue their annual Water Quality Report Card on the Boston Harbor Region's public beaches in Lynn, Nahant, Revere, Winthrop, East Boston, South Boston, Dorchester, Quincy and Hull. In the meantime, if you care about clean water and aren't afraid of cold water, you can join them for a quick dip, a refreshing Harpoon Beer and a burger, and the chance to win JetBlue flights at the Harpoon Helps Cupid Splash plunge and pledge fundraiser at noon on Saturday, March 21. Funds raised at the event will support free beach events and programs from Nahant to Nantasket this summer, when the water will be much warmer! Five Feet of Snow On The Beach Won't Stop Cupid Splashers! We're Saving A Space For You On The Beach In South Boston For This Year's Harpoon Helps Cupid Splash! 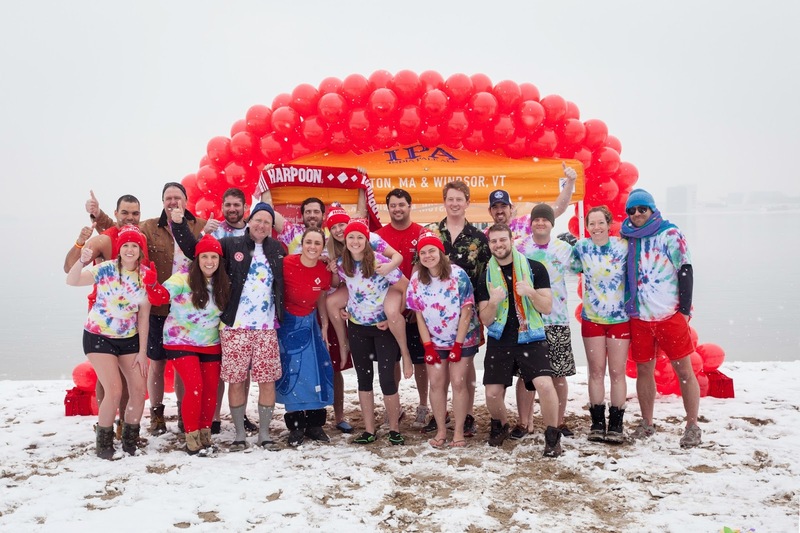 When we scheduled the 8th Annual Harpoon Helps Cupid Splash for the first Saturday of Spring on March 21st, we thought we knew what to expect. We're still looking forward to a fast dash across the beach on a brisk spring morning, a quick dip in the chilly water, the chance to win JetBlue flights and enjoy refreshing Harpoon beer and burgers on the beach with a few hundred costumed friends, all to raise funds to support a great cause. 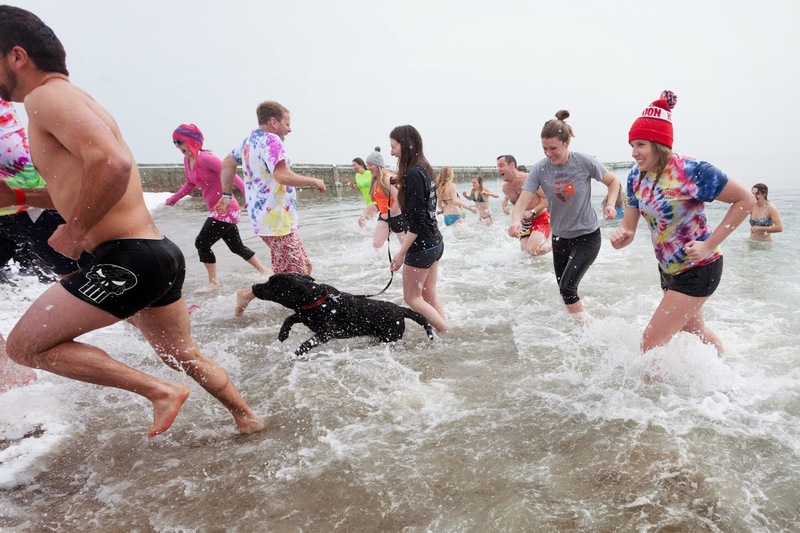 But with 60 inches of snow on the beach at the BCYF Curley Community Center at M Street Beach in South Boston and ice on Dorchester Bay, we were a bit concerned that the record cold and the record snow would dampen enthusiasm for this year’s splash. Snow on the beach at the BCYF Curley Community Center at M Street in South Boston. Fortunately, our friends and supporters have stepped up to the plate and are hard at work to make this year’s Harpoon Helps Cupid Splash the most successful splash ever! Despite the brutal winter, more than 100 hearty souls have already signed up for this year’s Harpoon Helps Cupid Splash at www.cupidsplash.com and already raised more than $10,000 to support free events on the Boston Harbor region’s public beaches this summer. So say “No!” to the snow and help us celebrate the first Saturday of Spring on the beach with us on March 21st. Registration is just $20, and includes a refreshing Harpoon Beer and a burger, the chance to win JetBlue flights for biggest fundraiser and best costumes, all for a very good cause. Start a team, challenge a friend or simply sign up as a “Chicken” and join us for a beer and burger at the party. Sure, you will be cold for a few minutes, but the warm feeling you get from joining in the fun and supporting the cause will last a very long time. See you on the beach on March 21st at noon! Since 2008, with the support of our friends at Harpoon Brewery and JetBlue Airways and our community partners in Nahant, Lynn, Revere, Winthrop, East Boston, South Boston, Dorchester, Quincy, and Hull have leveraged $205,000 in small grants received from Save the Harbor/Save the Bay’s Better Beaches Program with $815,722 in cash and in-kind contributions from local government and small businesses for a total investment of $1,020,722 in 214 free events and programs for the region’s residents and visitors alike. In 2014, Save the Harbor awarded $31,500 in grants and additional organizational support to 18 groups in 9 beachfront communities and waterfront neighborhoods. These groups in turn leveraged our funds with $212,222 in cash and in-kind support from local government and businesses and more than 5,000 volunteer hours to support 44 free concerts, beach festivals, soccer tournaments, swims and sand sculpting competitions. In the spring of 2015, Save the Harbor’s Better Beaches Grants Program will distribute the funds we raise at this year’s Harpoon Helps Cupid Splash and additional funds we have received from the Department of Conservation and Recreation at the recommendation of the Metropolitan Beaches Commission to support free beach events and activities in Nahant, Lynn, Revere, Winthrop, East Boston, South Boston, Dorchester, Quincy and Hull this summer. For more information on how to apply for Save the Harbor/Save the Bay’s Better Beaches Grant Program this year send an email to info@savetheharbor.org or give us a call at 617-451-2860.